Fascinating. Don't you love a good stoush? Margaret Pope has hit back at Michael Bassett's version of what happened inside the Labour caucus during the reforms, opening with "...the first time I ever met Dr Michael Bassett I felt my flesh creep". Oh my goo'ness, as a wide-eyed Shirley Temple would say. Pope rejects Bassett's claim that she was behind David Lange's rejection of the flat tax proposal, etc. She says Lange's rejection of flat tax was "one of principle". What principle was that? The reforms had a clear philosophy underpinning them and flat tax was in keeping with it. Bassett's book (which I haven't completed) makes the point very early that Lange had no strong political philosophy. Whether she stepped into the void with hers, I have no opinion on as yet. But clearly Pope still doesn't understand the political vision Douglas and Bassett shared and espoused. She says she was "prompted by social rather than economic issues". Sorry but the two are inseparable. What she is actually saying is she was more concerned about the short term than the long term - or the little picture over the big picture. And I think that is exactly what influenced Lange. "The writing is purple, overheated, even foam-flecked." Um. Anything like "...the first time I ever met Dr Michael Bassett I felt my flesh creep"? I'll be very, very surprised if it is. Certainly I have encountered any examples yet. She leans on other left-wing reviews (eg Gordon Campbell) that have branded Bassett as fixated with Pope and even anti-women. I find that quite silly. Bassett calls a spade a spade. Not one for shilly-shallying if I wanted an honest opinion or advice, he is a man I would trust. In fact I wish we could get him back into parliament as well as Sir Roger. On Wednesday I attended a debate between Kim Workman, National Director of Prison Fellowship and David Fraser, author of A Land Fit For Criminals. It was chaired by Mel Smith (who we heard rather too much from in a tight programme). The topic was, What Should Prisons Do? He concluded that he would rather see more money being put into higher education and poor South Auckland communities than spent on more prisons. What kind of society do you want to live in he asked? His ideal is a Christian, forgiving and compassionate one. - prisons do not make people even worse criminals. Most are very bad when they eventually get there. - prisons do protect the rest of society but there are too few criminals in them. He concluded it is a utter scandal that so many paroled prisoners are committing violent crime and hurting or killing people. What kind of society do we want to live in? A safe one. I went with an open mind but came away (depressingly) concluding that David Fraser is right. The priority for the function of prisons must be to keep the public safe because they are failing to either rehabilitate or deter. Workman used some graphs based on statistics that hide more than they reveal, to Stephen Frank's frustration, who pointed out that while lines on the graph were not showing increasing crime, police tolerance had increased and much crime was now being ignored. I became somewhat agitated myself when he talked about putting more money into Otara and Mangere. I pointed out that these communities were already turning on welfare. Kim Workman is to be admired for his attempts to reform prisons and their inmates. But his abiding faith and idealism may very well contribute to the degree of danger the rest of the law-abiding community is exposed to. It is not a conclusion that sits easy with me. I believe in giving people a second, maybe even third chance. I want to believe people can change. Some can. But it would appear more cannot. He claimed many individual views about criminals and prisons are formed young and often by a cataclysmic experience. I imagine this was a reference to those members of the Sensible Sentencing Trust in attendance. That may be but others attitudes are formed by observation of the facts. Public safety is paramount. And, as Mr Fraser alluded to more than once, nobody is forced to commit crime. Free will exists. 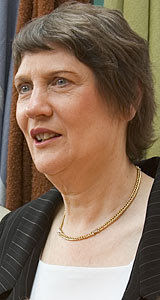 Prime Minister Helen Clark says a postal ballot in 2009 is the best course for a potential referendum on the anti-smacking law because having it on election day would cause voter confusion and slow down the vote count. I hope this is the last piece of corruption we have to stomach from this government. The Prime Minister's reaction to the anti-smacking CIR is actually worse than her support for the legislation after earlier ruling it out. There is every provision for the referendum to be held at the same time as the 2008 election. How did she manage to procure the advice she wanted to hear? In a speech to launch my candidacy I observed that my recent canvassing, which comprises superannuitants, has shown there is a large chunk of disillusioned Labour voters. The proverbial straw was the anti-smacking legislation. Here we have an entire generation who have been told they got it fundamentally wrong. And that hurt. Now she is rubbing salt in the wound by saying voters are too stupid to handle more than one choice on her big day. And it will be a big but very bad day for Labour. Without the referendum voters will still express their anger and alienation. They will either vote against Labour or stay home. Russell Fairbrother: What is the main reason for people to move off the unemployment benefit? Hon RUTH DYSON: The main reason for people leaving the unemployment benefit is to enter paid employment. 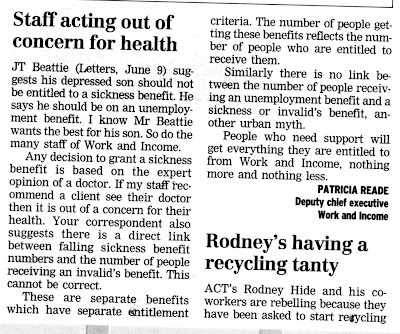 It is simply not true to allege, as the National Party does, that a large number of people move from the unemployment benefit to the sickness or invalids benefit. Between March 2000 and March of this year there were close to 1 million cancellations of the unemployment benefit; 8.8 percent of those cancellations were because of a transfer to the sickness benefit, and only one-third of 1 percent were because of a transfer to an invalids benefit. The main reason for people leaving the unemployment benefit is to move into paid work. That means there were 88,000 transfers from the unemployment benefit to the sickness benefit. From there many thousands have transferred to the invalids benefit. To claim there is no link between benefits is absurd. The very fact of being on a benefit can trigger behavioural responses which then necessitate the need to be transferred to another benefit. For instance being on an unemployment benefit long-term can cause people to develop depression, one of the major reasons for the rapid growth in incapacity benefits. Being on an unemployment benefit and relieved of the need to work can lead to people developing alcohol and drug addictions. This then necessitates a move onto a sickness or invalid benefit. The letter from Work and Income is quite unbelievable. Or do I no longer understand what the word 'link' means? The Government hgas done a lot to help out. Working for families has helped lift more children out of poverty than at any time since the Great Depression. Income related rents for state houses, cheaper doctors visits and much more have helped thousands of families. The minimum wage is up by $200 a week for the very poorest workers. And best of all, around a thousand jobs a week have been created every week for the last eight years. That’s 330,000 more jobs. For a start 52,000 jobs a year for eight years would be 416,000 jobs and the obvious typo is not mine. The only jobs governments create are those of bureaucrats and public servants. The rest are created by the private sector. ....an Auckland University public policy lecturer and former Children's Commissioner, Ian Hassall, said the Working for Families package had probably helped reduce child poverty by at least 10%. But he said with possible job losses in the predicted economic downturn, many of these gains were likely to be lost. And my own response is that it was Jim's lot that was responsible for creating the latter day 'child poverty' with the DPB. It's a bit rich to now be skiting about moving a few people sideways from the DPB onto an In Work payment. And to compare that with the recovery from the Great Depression is just ludicrous. Interestingly for the newspaper ad the wording has been changed from, "The Government hgas done a lot to help out," to "There has been a lot done to help out." Is this to avoid creating the impression the advertisement is asking for votes? Has it all been paid for by Parliamentary services? Did we all pay for this bunkum? I tried sending Dear Jim the following message but the fields have also been set up incorrectly resulting in a failure to submit. Government gets in the way of people caring for each other by taking tax for so-called 'welfare'; by 'applying Christianity' on behalf of individuals. It is your political allies that created the DPB, that in turn created latter-day child poverty. If you would just stop 'caring' we would all be better for it. What does a Labour government do when throwing money at a problem has only made it worse? Throw some more. In the UK Gordon Brown is now promising cash grants of 200 pounds to get parents of under-fives to look after their children properly ie teach them to read, feed and vaccinate them. I would bet any money you like that the problem parents are those who are already welfare dependent. But no. Let’s have another bet. Which New Zealand party will be the first to pick up this policy? National or Labour? No father should need to be told that his responsibility does not end at conception, The Dominion Post writes. It is, however, a sad reality that increasing numbers do need to be told just that. Not enough young men acknowledge fatherhood is a life-long commitment, not a bothersome by-product of a sexual encounter that someone else will take care of. United States presidential candidate Barack Obama's decision to deliver just that message on the day Americans celebrate fatherhood is a welcome attempt to provide some long-needed reality in a debate that is fogged by a willingness to excuse irresponsibility. Too often for children at the dawn of the 21st century the narrative of their growing years is drawn not from Father Knows Best, but The Man Who Wasn't There. In this country there are 95,861 people of working age receiving the domestic purposes benefit, nearly 90 per cent of them women. Maori are hugely over-represented in those figures, accounting for 41.4 per cent of those receiving the dpb. In the 2006 census, nearly a third of the children in one-parent households identified themselves as Maori. No one should pretend that a two-parent household is inevitably better than a solo-parent one. No relationship between parents is infinitely better than an abusive one where the family lives in fear of the next angry outburst and the next beating. But nor should any notions of political correctness be allowed to disguise the reality that children benefit immensely from having two parents who love and support them, and who provide a stable environment where they canlearn what it is to be an adult. Boys in particular need to have strong male role models and the natural person to do that job is the father. Mr Obama said as much in his Father's Day address, speaking of the burdens single parenthood had imposed on his mother, of "the hole in your heart when you don't have a male figure in the home who can guide you and lead you", of his own resolve to break the cycle and his determination "that if I could be anything in life, I would be a good father to my children". Too few share his determination and too few understand that the solution is not more money in benefits but more responsibility. Young men now fathering children and then abandoning them need to get the message that it is more staunch to hold down a job, raise a family in a loving environment and develop a stake in the community, than it is to strut around wearing a patch and beating people up. Gang culture, with its warped sense of belonging, is a poor substitute for a true family, but that is what many young Maori in particular are left with. Outspoken black advocate Al Sharpton predicts parts of the US black community will attack Mr Obama for "airing dirty laundry" and say he is beating up on the victims. But he also told the New York Times that not discussing it is not going to make it go away, and Mr Obama's comments were "courageous and important". What New Zealand needs is for its leaders to be as courageous as Mr Obama, and to speak as plainly. Then its absentee fathers might begin to realise that real men don't run away. The message, Real Men Don't Run, is a good one, but fails to appreciate the 'real' situation. Granted some males run away from commitments to relationships. But so do many women. Using DPB statistics tells us nothing about who ran. Ever since the state assumed the financial role of the absent father, the single mother industry has boomed. Many women choose single motherhood by leaving a relationship or having a child outside of one. The trend is towards the second scenario. Her choice is very much influenced by the promise of indefinite taxpayer support. Her decision made, the man is often left with little but an eighteen year child support bill. It was entirely predictable that the DPB would change the balance of power in parenting relationships. There is little more important than fatherhood but too many of both sexes discount it and are 'sanctioned' by a benefit. Unfortunately society cannot have it both ways. If we genuinely want fathers back in their children's lives as the norm, the DPB has to go. It was created at a time when women were not as well-educated, had fewer work skills and barriers to their advancement were greater. It is now time to revisit this policy. A question came from an older man who wanted to know from the Minister if there was provision to "review the Pathways To Inclusion policy". He explained why he wanted one. The Minster gets up and says, "There will be no review, " in a way that left no-one in doubt that she is the boss. I got up and said what I was sitting there thinking. "I am appalled that the Minister is telling you, the people who work in the sector, that there can be no review. This is the whole problem with government monopolising a sector and it is central to ACT's philosophy of less government. You are.... You are government slaves." I had intended to say something a little more moderate like you are captured by government dictates but it wouldn't come out. This was the first time I had witnessed a Minister wielding her power and I was truly appalled. I was greeted with silence. I don't know whether they were shocked or hurt or disapproving. I so much wanted them to take a step back and consider what is going on here. People talked to me afterwards which is always a good sign:-) Not about that specific comment though. I was the only candidate who talked about the blow-out of the sickness and invalid benefits and how the misuse of these benefits removed resources from genuinely needy. That people sitting on these benefits unnecessarily were like people who park in disability parks. They make life for the disabled that much harder. Concern about this was reflected back to me privately. The suggestion being that the proliferation of drug and alcohol problems is only going to see this problem get much worse in the future. Silence is the scapegoat now. This is the inevitable result of the thinking that 'it takes a village to raise a child.' And it's right up there with ideas like Asian women shouldn't carry so much cash in their handbags if they don't want to get murdered. Always the collective conscience is looking for excuses and finding them in the wrong places. Clearly in a black and white world neighbours will make every effort to help a child they perceive as being ill-treated. But what if the neighbour has no faith in or their own fear of the authorities they are expected to turn to? Worse, what if they have been threatened with violence to their own children? You may not think these are good enough reasons to 'mind their own business'. Frankly I do. I would put my own children before someone else's because that is my job. If other people were doing their job, well, this horrid 'sophie's choice' situation wouldn't arise. In an almost 'Oh, did I forget to mention...' vein, we get halfway through the story before the real culprit shows up. Another young Maori man looking for a mother substitute but acting out his father's life no doubt. So thanks to the newspaper's slant I expect today talkback will be abuzz with the gross failure of somebody else to take responsibility and act. Unfortunately most people cannot comprehend the dark and mean psychology that pervades in neighbourhoods where violence is normal. Big News has a post about why he is voting Labour. The scary thing is that although Dave is tongue in cheek his reasons find their basis in reality. They are exactly the reasons why people vote Labour.